Following the successful completion of two Regional Eye Clinics in Armenia, we are excited to announce the development of our third Regional Eye Clinic — in Kapan, Syunik! Launched in 2014, our Five-for-Five campaign — developing five Regional Eye Clinics throughout Armenia for $5 million in five years — has successfully completed two clinics — the Haig Boyadjian AECP Regional Eye Clinic in Ijevan, Tavush, opened in 2015, and the John and Hasmik Mgrdichian AECP Regional Eye Clinic in Spitak, Lori, opened earlier this year. Now, we are “Kicking Off” our third Regional Eye Clinic — Kapan, in the Syunik province — with a crowdfunding campaign! Our goal is to raise $10,000 so we can purchase 11 much-needed pieces of equipment for the clinic. Ophthalmology equipment for Kapan — a major component of the total cost of the clinic — includes cutting-edge medical equipment for diagnosis, treatment, surgery and telesurgery. Raising funds for this equipment is critical in making the Kapan Regional Eye Clinic a reality and bringing sight to the people of Kapan and the Syunik province. Access to quality eye care — geographically and financially — is the biggest challenge for Armenians. With two-thirds of Armenia’s population living outside of the country’s capital, many residents struggle to gain access to basic eye care or surgery because there have been few eye care facilities outside of Yerevan. 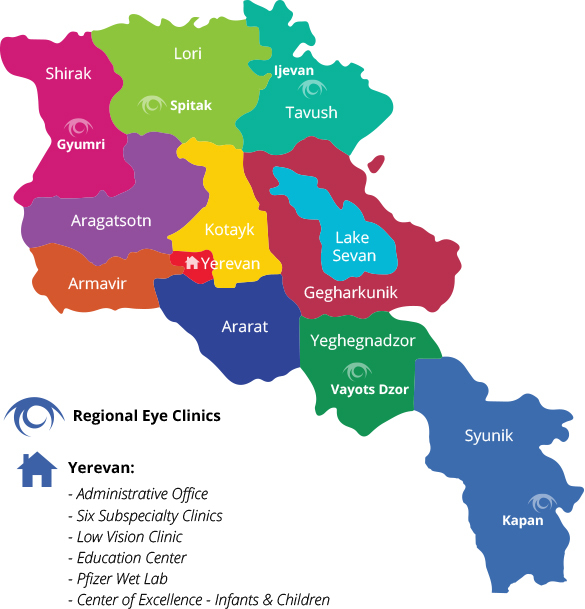 Prior to the development of our Regional Eye Clinics, just four towns outside of Yerevan provided basic eye care and most surgery was available only in the capital. Few Armenians are able to travel the distance because of cost and other factors and they have to go without care, leaving many visually disabled. The Regional Eye Clinic in Kapan will provide access to quality eye care and eye surgeries for the 153,000 residents living in the Syunik province — about 1,500 of whom currently have at least one blinding eye disease. With Kapan as the center of regional activity for those living in the Syunik province, the Clinic in Kapan will ensure that the highest number of residents in the region will have access to a local eye care facility and receive quality eye care. We encourage our friends, supporters and the greater Diaspora community to help develop the Regional Eye Clinic in Kapan by participating in our “Kick Off Kapan” crowdfunding campaign. Give the gift of sight to Armenians in the Syunik province by donating on CrowdRise. Also, join “Team Kapan” and fundraise with your circle of friends and family! Your contribution — big or small — will make quality eye care more accessible in Armenia and bring sight to Armenian eyes.